Art has many functions beyond aesthetic. One of the functions is to satisfy the need to create: art exists because artists are moved to produce. There is an inner imperative that the artist is compelled to follow and the consequence —the piece of art—is the by-product of that inner mandate. 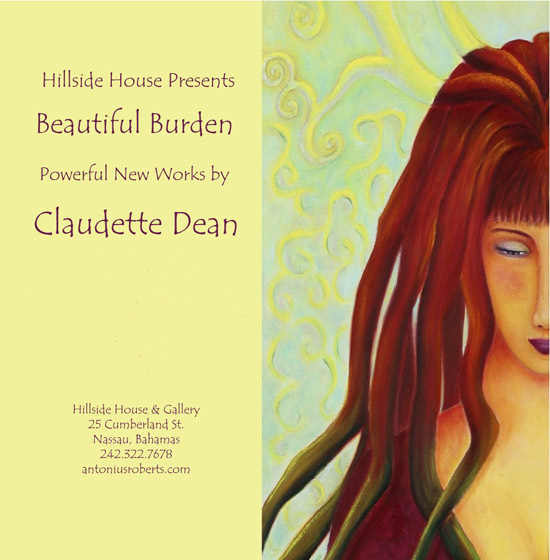 Claudette Dean's latest body of work, Beautiful Burden, explores and expresses her personal and yet universal journey into her spiritual beliefs. Springing from her like a visual meditation, the work infers a private mythology. It is imbued with secret meanings and imagery—there is a sense that she is showing us a path that is clearly the result of a profound and unique inner directive. 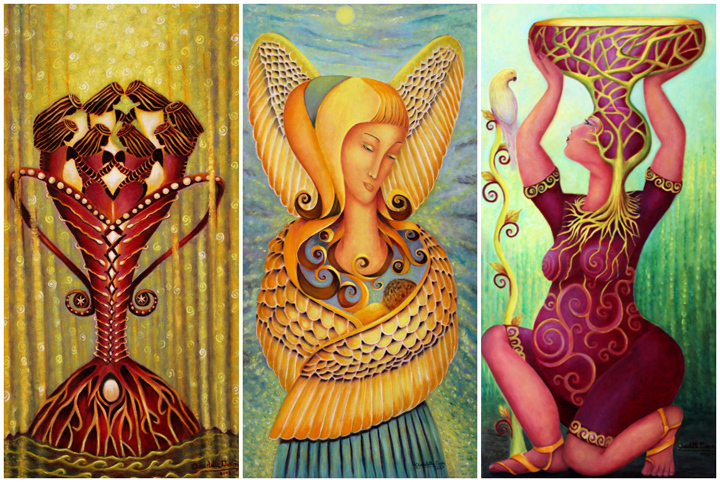 This series is reminiscent of her first paintings, gesturing towards surrealism. There is an air of the dream state. As if Dean had to lose herself and this reality to find these images. An unknown narrative underpins the work, creating a connecting, yet silent, structure to the pieces. She hints at paradox and duality, themes of male/female, life/death, full/empty, body/spirit, even the title of the show, Beautiful Burden, succinctly surmises one such paradox. Dean's work has often been rooted in her beliefs about life and love, often from a strongly female perspective. In this new work she introduces a male element—The Guard IAMs. The 'guardiams'—masculine golden ghost-like figures—hover in and out of physicality. They carry shields and bear symbols that tie them, as Dean explains, “to Africa, and earth”. The guardiams were inspired by Dean's need to create a sense of safety and the writings of Paul Ferrini in The Silence of the Heart. Ferrini discusses the importance and the role of the masculine energy in relationship to the feminine. 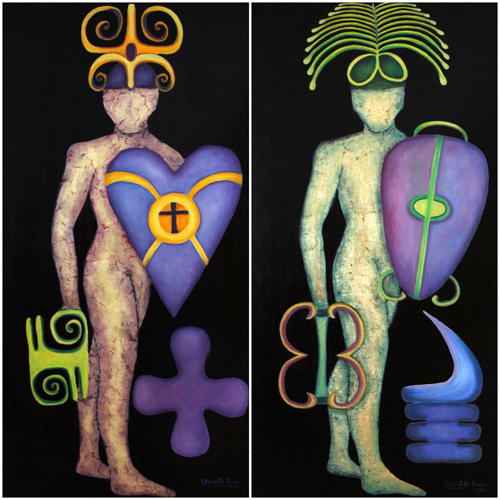 Dean brings that idea into form with her 7 depictions of male protectors. Through the process of her work, she concluded that the male protagonists were guards of the self—the I am, hence, the name, GuardIAM. In contrast, the piece Beautiful Burden exudes a deep intrinsic understanding of the feminine. There is a resounding fullness to this work. She is abundant, full and sensual, yet powerful and confident. Dean's images of women, once again, exude an assured and saturated satisfaction. There is a redolent peace and ecstasy to Beautiful Burden, and even, Bearing, with its more contemplative feel. Grace, Surrender and SHE swim from other-worldliness. However, one must acknowledge the presence of the male protectors and their implication to the body of work: The stoic presence of the guardiams witness and hold space for the exultation, contemplation, and meditation, of the wise women—they inform and balance with the feminine. The pieces that contain the image of chalices move us back into the realm of symbolism and narrative. And there is once more a feeling of secrets hidden as messages in her work. An interplay of male and female, emptiness and fullness. To Dean, these stories are clear, but the viewer is left to discover their own interpretation and delve into their own being to find sense and poetry in their mystery. As a whole, the works challenge, tantalize, entrance and inspire—it is a phenomenal gift to pull into imagery the unimaginable inner world, yet Dean does it with a quiet confidence. There are many functions to art, and telling stories of a different spiritual reality is the happy and intriguing by-product of Dean's need to create.